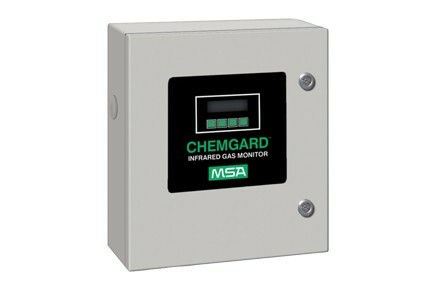 The CHEMGARD Gas Monitor from MSA can monitor more than 60 gases in the TLV range such as Hydrocarbons, solvents, alcohol’s, alkanes and toxics. The photoacoustic infrared sensing technology provides precise, low cost and high performance monitoring. It is extremely stable and highly selective to the gas of interest and can operate for months with virtually no zero drift. Cross sensitivity to water vapour, a common problem with many types of infrared analysers, does not occur with the CHEMGARD. Its proprietary sensing technique determines the amount of water vapour in the sample and subtracts it from the gas reading. This provides an extremely stable gas reading, with no compromise in the instruments sensitivity. The instrument typically draws the gas sample via an internal pump. An internal flow switch alerts the operator if the gas sample is blocked. An optional multi point sequencer can be included in the CHEMGARD to allow either 4 or 8 points to be sampled.